← Navigating Wheeled Mobility? MassMATCH wants to know! SHARE client Robert Maloney says it is his responsibility to educate other people “in the same situation I am in” about the possibilities available through assistive technology. 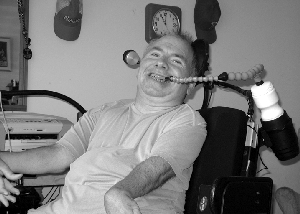 Since May of 2007, Bob, who has cerebral palsy and quadriplegia, has been living independently in an apartment in North Easton. He previously worked with Easter Seals and was trained on Dragon Naturally Speaking, a software program that activates household items and the computer via vocal commands. He operates his several systems by pressing switches with his head, using his voice, and sipping on a special tube. About a year ago, he began working with Tom Meggison, computer technologist at the UMass Dartmouth Center for Rehabilitation Engineering, which SHARE funding supports. Bob has what amounts to three separate and independent systems. The first employs a head switch mounted on his wheelchair that sends a radio frequency signal to a SHARE-modified garage door opener that Tom interfaced to the device that opens Bob’s apartment door. The second system is a voice activated infrared controller with which Bob can operate any device that responds to an infrared signal. He actually has two of these—one in his bedroom and one in the living area. By means of an X-10 interface, Bob uses his voice to control his TV, two separate air conditioners, his radio and CD player, several lamps, and overhead lights, as well as the buzzer system that enables him to open the outside door to the apartment complex. “I want to use the knowledge I have every day to do for myself and rely on what I have,” he says. Although Bob is assisted by personal care attendants, he spends a lot of time alone at home. “Technology is so important. If there’s a problem, I first try to figure it out and troubleshoot…” Tom notes that Bob is different from typical clients because he is “proactive and recommends things to us.” For example, following a recent hospital stay, Bob saw other quadriplegic patients with cups mounted on their wheelchairs and at their bedsides. After trying what Bob describes as “frustrating Velcro and duct tape type alternatives that ended up spilling all over,” Tom installed a Drink-Aide on his chair. Designed by and for people with disabilities, the Drink-Aide has served him well. This entry was posted in Assistive Technology, Success Stories and tagged SHARE. Bookmark the permalink.